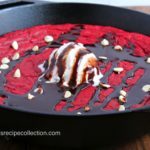 Delicious red velvet skillet cookie perfect for Valentines or Christmas Dessert! Any red velvet fans out there? I swear that we love red velvet everything. Southern red velvet cake, red velvet cupcakes, and even red velvet cookies! 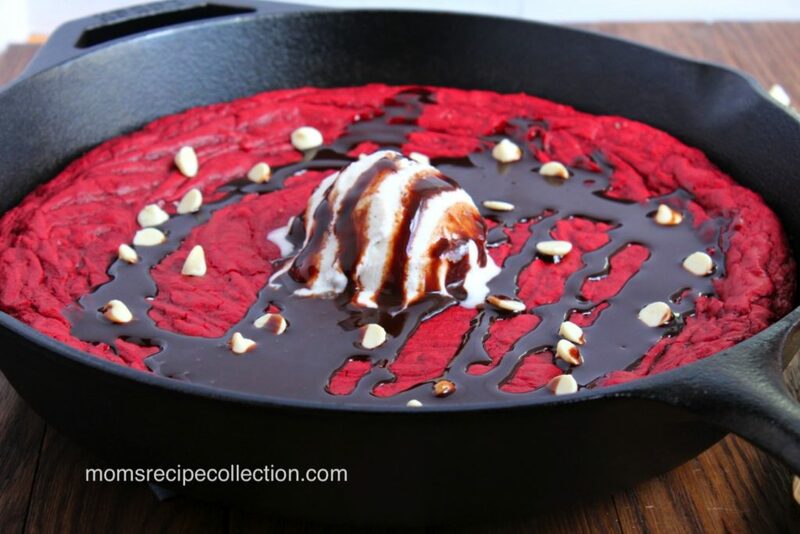 In this post we’re going to show you how we make a big red velvet skillet cookie using cake mix. Only a few ingredients are need for this amazing Christmas or Valentines dessert cookie, so let’s get right to it! Save & share this recipe on Pinterest! This Red Velvet Skillet Cookie is so sweet and chewy, the perfect decadent dessert! Preheat oven to 350 F, and grease a 10 inch cast iron skillet. In a large bowl, whisk together butter, eggs, and about a cup of the cake mix, until there are no more chunks of butter. Using a mixing spoon, gradually mix in the remaining cake mix. Stir in the white chocolate chips, and press dough into greased skillet. Bake for 18-22 minutes, until set. Serve warm with ice cream and fudge if desired.